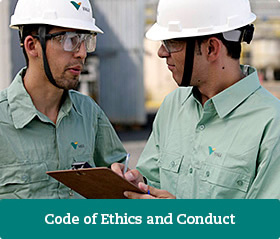 The fundamental principles that guide the action of Vale and its subsidiaries in this area are to be found in our Code of Ethics and Conduct. These principles must be followed by everyone who acts on behalf of the company: the Executive Board and employees, interns, contractors and partners. When making an allegation using the electronic form, by phone or by email, you will receive a protocol number that you may subsequently use to submit additional information or verify the investigation’s progress and results. Click here to find out more.